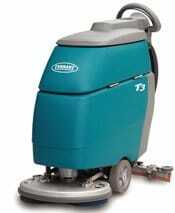 The T3 scrubber dryer has a 500mm scrubbing path and a 40 litre solution tank capacity. 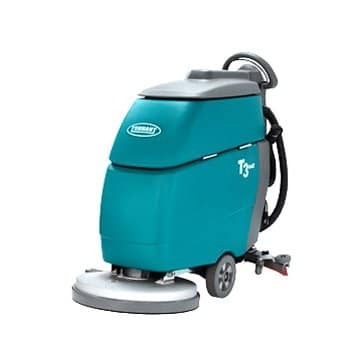 The T3 delivers an advanced state of safety and cleanliness with the option of the award-winning FaST technology or ec-H2O technology and a sound level that is 75% quieter than leading competitive models and comparable to normal conversation levels. 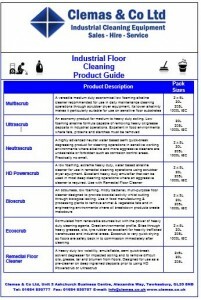 Improve environmental health in your facility. Exclusive Hygienic tanks allow for easy access and sanitization, reducing mould, bacteria and other contaminants that can grow in enclosed tanks. Even around 180 degree turns, the T3 scrubber dryer’s equal pressure, parabolic squeegee recovers all cleaning solution from the floor. The T500 65 is a larger floor scrubber dryer with a 85 litre solution tank and the T2 43 is an alternative smaller walk behind scrubber dryer.